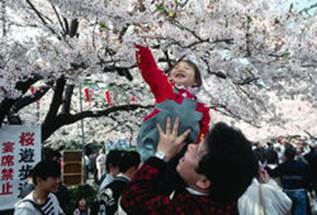 Hanami celebrations under the cherry blossoms in Ueno Park, Tokyo. 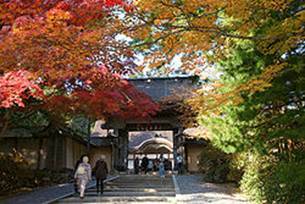 Autumn maple leaves (momiji ) at Kongōbu-ji on Mount Kōya, a UNESCO World Heritage Site. Japan has a total of 6,852 islands extending along the Pacific coast of East Asia. The country, including all of the islands it controls, lies between latitudes 24° and 46°N, and longitudes 122° and 146°E. The main islands, from north to south, are Hokkaidō, Honshū, Shikoku and Kyūshū. The Ryūkyū Islands, including Okinawa, are a chain to the south of Kyūshū. Together they are often known as the Japanese Archipelago. The islands of Japan are located in a volcanic zone on the Pacific Ring of Fire. They are primarily the result of large oceanic movements occurring over hundreds of millions of years from the mid-Silurian to the Pleistocene as a result of the subduction of the Philippine Sea Plate beneath the continental Amurian Plate and Okinawa Plate to the south, and subduction of the Pacific Plate under the Okhotsk Plate to the north. Japan was originally attached to the eastern coast of the Eurasian continent. The subducting plates pulled Japan eastward, opening the Sea of Japan around 15 million years ago. Japan has 108 active volcanoes. Destructive earthquakes, often resulting in tsunami, occur several times each century. The 1923 Tokyo earthquake killed over 140,000 people. More recent major quakes are the 1995 Great Hanshin earthquake and the 2011 Tōhoku earthquake, a 9.0-magnitude quake which hit Japan on 11 March 2011, and triggered a large tsunami. On 24 May 2012, 6.1 magnitude earthquake struck off the coast of northeastern Japan. However, no tsunami was generated.